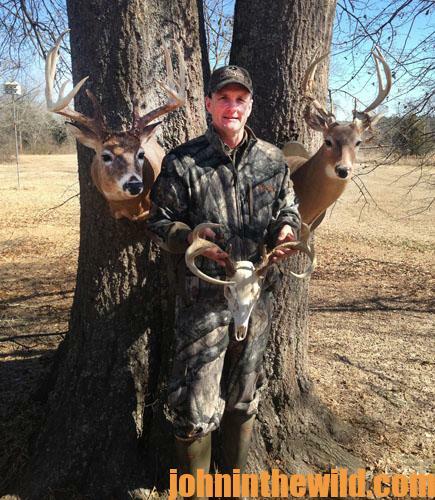 This hunt took place in Illinois on public-hunting land where I’d taken the buck that scored 160 Pope and Young (See Day 1). 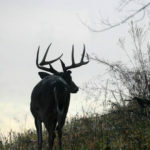 After I’d hunted that spot for 2 or 3 years, that area was receiving more hunting pressure. I just wasn’t seeing as many deer as I did the first years I hunted there. So, I decided I’d start walking the property lines of this WMA in regions where I hadn’t checked before. One of the boundaries was an abandoned railroad track I walked. I probably walked a little over 1-1/2-miles down the railroad track, until I came to a trestle that went over a small creek. About 10 acres of thick-cover public land was on the other side of the railroad track that was CRP (Conservation Reserve Program) land. I decided to investigate those 10 acres. A little creek was between two hills, and then on top of one hill was a cornfield. The bottom was so grown-up with vegetation that I hardly could see the signs that marked the boundary of the public-hunting property. As I stomped through that thick cover, I heard a deer get up and run-off. I kept looking, but I couldn’t figure out how the deer were coming into the thicket where apparently they were bedding. When I got down to the creek, the creek was too wide for me to cross. I followed the creek back to the railroad tracks. I was going to climb up the bank, walk across the trestle and go down on the other side of the creek. However, once I arrived at the trestle, across the creek I spotted a well-defined deer trail that went under the railroad trestle. I looked for trees where I could put up a tree stand but couldn’t see any. I climbed up the bank, walked across the trestle and investigated that side of the creek. I saw that the land on the opposite of the creek from where I had started scouting was much flatter than the land on the other side of the creek, including a flat creekbank that went under the trestle, providing easy access for the deer to go under the trestle and get into the other woods. I went back to the other side of the trestle where there was riprap on the edge of the creek. I got some sticks and limbs and pushed some of those big rocks up and made myself a little blind on the opposite side of the creek from the deer trail that went under the trestle. The next morning before daylight, I got a cushion to sit on, took a couple of my Mossy Oak shirts and walked down the railroad tracks. At the trestle, I climbed down the rocks to where I’d built my little blind and tucked the Mossy Oak camouflaged shirts around some of the rocks. I ranged the distance from my blind to the trail that went under the trestle on the opposite side of the creek at 27 yards. 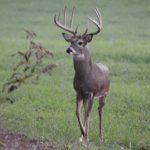 I thought to myself, “I’m at about the same height I’d be in a tree stand, and I didn’t have to carry that heavy tree stand the 1-1/2-miles down the railroad tracks.” I hunted that spot for 3 consecutive mornings and spotted lots of does and a few small bucks. However, I never saw a shooter buck. But this was on October 20th in the early part of the season. My hunting partner and I decided to return to Illinois on November 8th. My plan was to hunt that same railroad trestle stand. 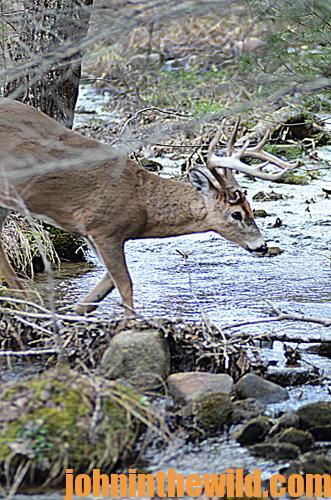 On the first morning in November that I hunted the railroad trestle, I didn’t see many deer. But later in the morning, I spotted a doe come out from under the trestle from that big block of public-hunting land on the opposite side of the trestle from where I was hunting. Although she was looking back, I never did see a buck. The trestle was to my right, and the deer trail was to my left. Then I heard a deer coming down the trail headed toward the trestle. I thought it probably was the doe that had come under the trestle earlier. I figured she had turned around to return to the big block of woods on the other side of the railroad tracks. 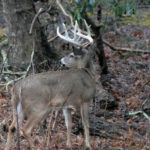 But a huge buck with big, heavy antlers came down the trail headed right for the trestle. I came to full draw, aimed and grunted with my mouth. 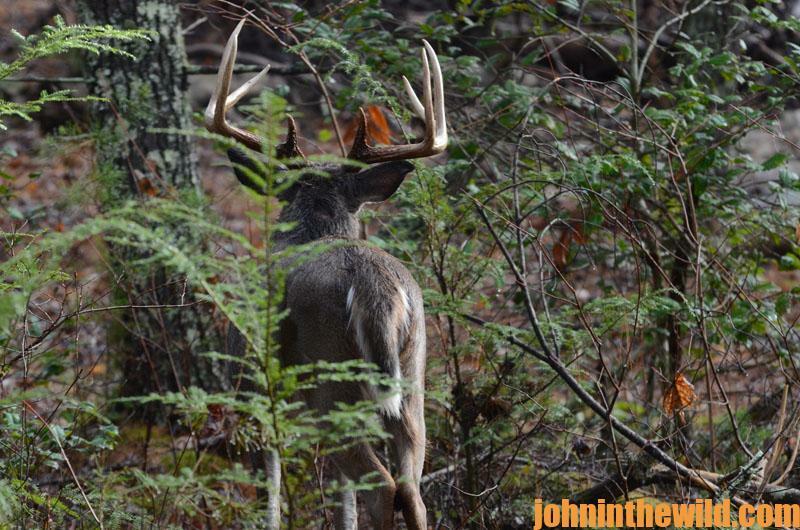 The buck stopped and looked up, just as I released the arrow. 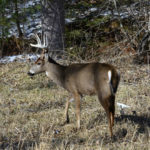 When the buck took the arrow, he jumped-up, wheeled around and started running back the way he had come. I grunted again. The buck stopped, stood still for about 10 seconds and then fell over. 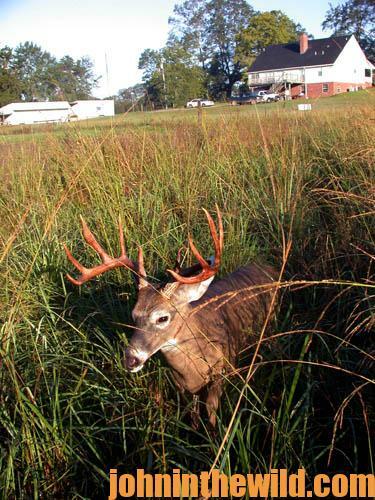 This buck was a 12-point that scored 141 on Pope & Young. 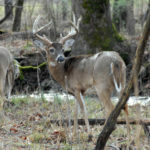 I learned once again that some really nice bucks can be found on or near small places in public-hunting areas. 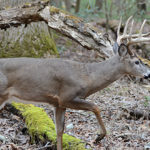 My secret to finding those bucks was to walk what everyone believed was the property line and search for those small, offset thick-cover places that only might be 10 or 20 acres but were still part of the public-hunting land. These small spots generally didn’t show up on the maps as public-hunting regions. But once you’ve identified those spots, they’ll be marked as a part of the public-hunting property.